Wat, we̠t’, wot or tsebhi is an Ethiopian stew or curry that may be prepared with chicken, beef, lamb, a variety of vegetables, spice mixtures such as berbere, and niter kibbeh, a seasoned clarified butter. 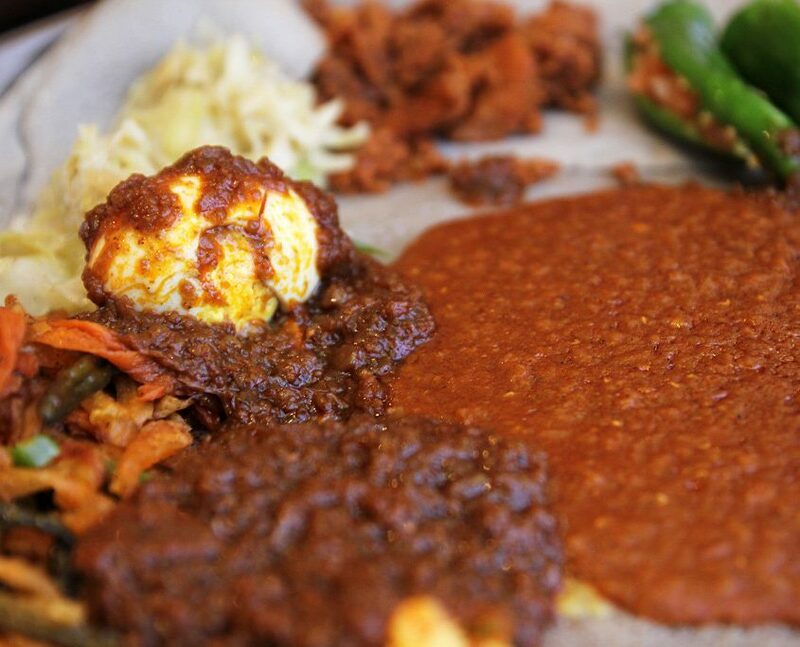 Be sure to try our “Dero Wat” thats tender chicken cooked in a mild sauce served with hard boiled egg and injera. Or try the “Ye’beg Key Wat” succulent lamb meat cooked in berbere sauce. Wat begins with a large amount of chopped red onion, which is simmered or sauteed in a pot. Once the onions have softened, niter kebbeh or, in the case of vegan dishes, vegetable oil is added. Following this, berbere is added to make a spicy keiy wat. Turmeric is sometimes used instead of berbere for a milder alicha wat or both spices are omitted when making vegetable stews, such as atkilt wat. Meat such as beef, chicken, fish, goat or lamb is also added. Legumes such as split peas and lentils or vegetables such as potatoes, carrots and chard are used instead – for the vegan dishes. Ask your server for more information on how our chefs prepare the Wat or to ask for it the way you like it. https://www.lalibelaethiopianrestaurant.com/wp-content/uploads/2017/07/Lalibela-Logo-300x110.png 0 0 Roger Metivier https://www.lalibelaethiopianrestaurant.com/wp-content/uploads/2017/07/Lalibela-Logo-300x110.png Roger Metivier2017-07-07 12:17:562017-07-07 12:38:15What is "Wat"